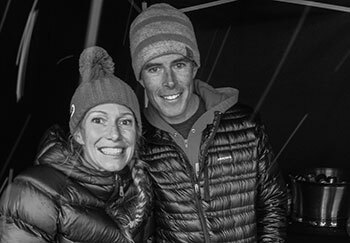 Christy follows the route pioneered by Albert Ellingwood, ninety years ago. Often there was only one way to go along the ridge, which meant we were likely following in his exact footsteps. -Albert Ellingwood, as recounted in his notes and published in Jeff Arnold’s book, Albert Ellingwood – Scholar of Summits. 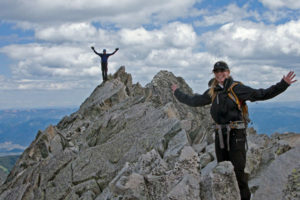 Dirk and Christy climbing one of the dozen and a half ridge highpoints. The descent route followed the right skyline in the photo. Ellingwood’s solo effort on that late August day in 1921, the first reported ascent of the ridge that now bears his name, was way ahead of its time. Last weekend, Christy, Dirk and I followed in his footsteps, and despite the passing of ninety years, it seemed as though not much has changed. We did our best to climb over each ridge highpoint, which meant we had to climb down from each ridge highpoint, too. 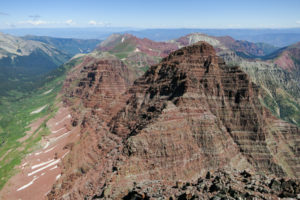 Sure, the approach route through the forest to the base of the ridge is easier to follow, and compared to 1921, the descent down the standard Northwest Ridge feels more like a paved sidewalk than a wilderness trail, thanks in part to the efforts of the Colorado Fourteeners Initiative. 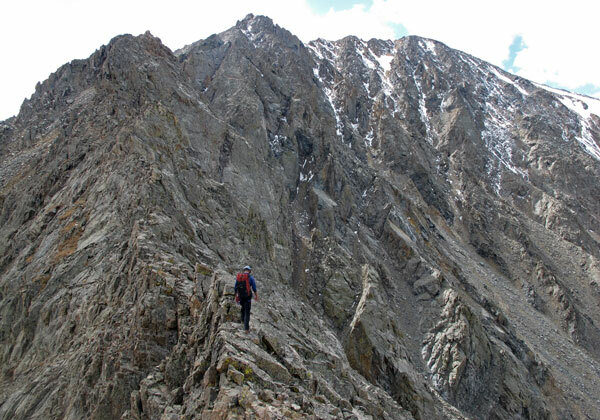 But the Ellingwood Ridge proper, the granite arm that descends from La Plata’s 14,336 foot summit for nearly two miles and entirely above 13,000 feet, shows very little in the way of a well-worn route. 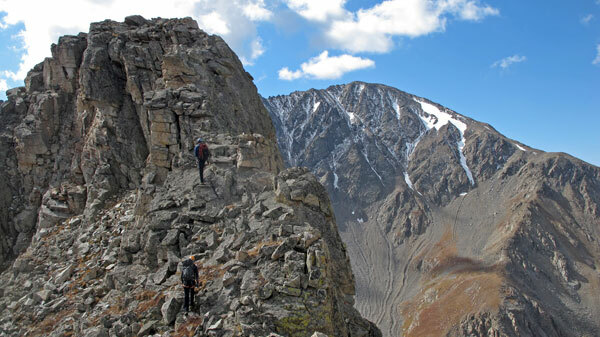 When compared to other popular Colorado peaks, there is hardly any evidence of people having been there at all. Dirk, stands tall atop one of the countless pinnacles. 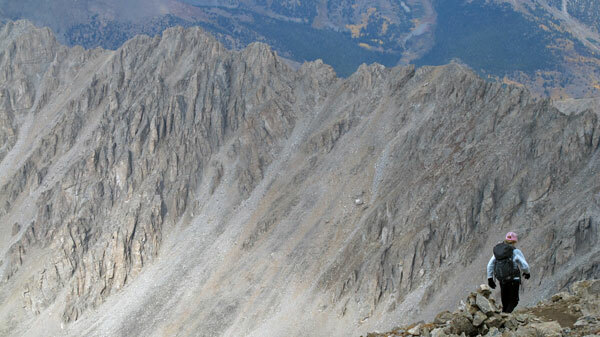 La Plata’s summit and couloir ridden North Face looms in the distance, hours away. 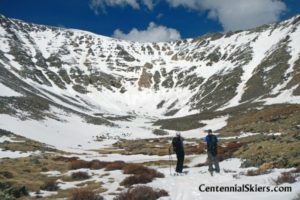 It’s an awesome alpine outing, and in my opinion, one of the best 14er ridges in our neck of the woods. 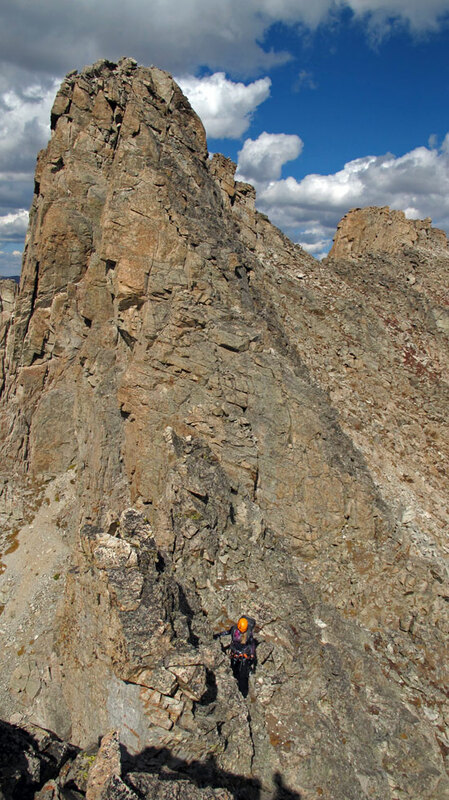 If airy positions on good rock with options for moderately technical climbing and rappels sound like fun, then, and I know I say this a lot, this should be on your to-do list. It deserves the classic status bestowed upon it. Christy descends again. One more tower down, many to go. Careful on this one. 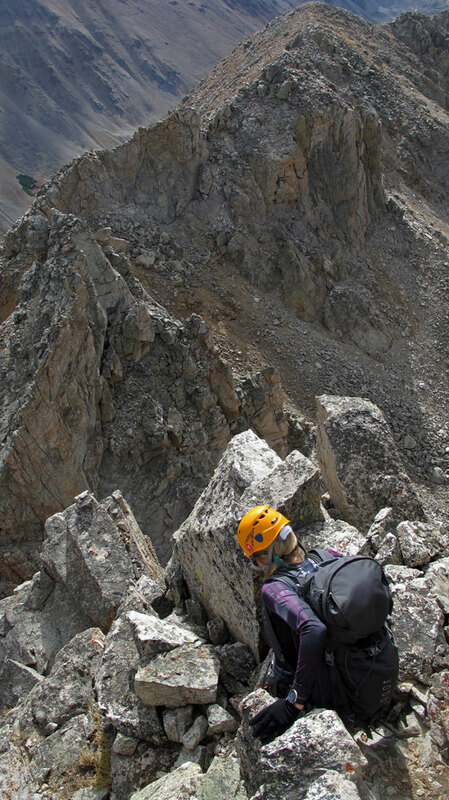 The rope was used for one rappel, as well as to protect on airy lead somewhere mid-ridge. 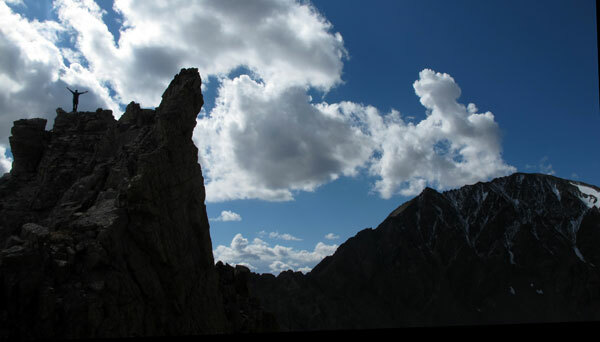 Otherwise, the crux moves mostly fell in the Class 4 range of difficulty. Dirk’s finally past the lengthy stretch of towers that seem to go on forever, yet never really gain in elevation. 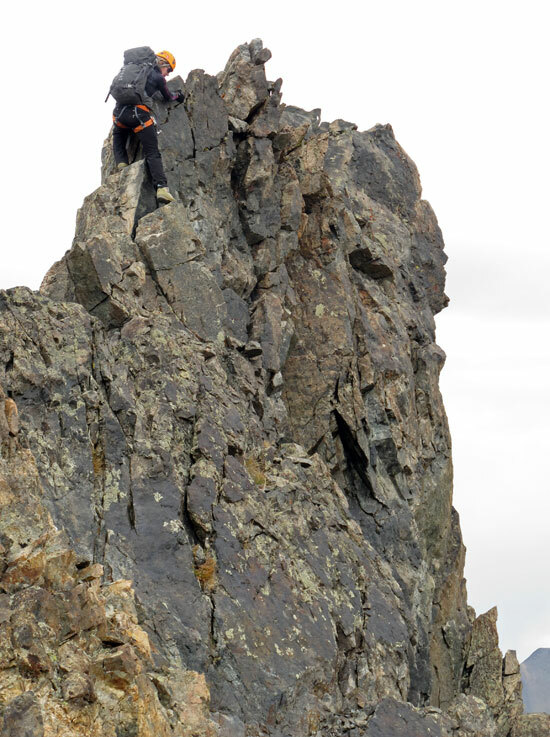 Only after several hours of climbing does the ridge actually start up towards the lofty summit. And much like Ellingwoods’ notes mentioned, it’s here where the length of the day starts to be felt, both mentally and physically. It’s a long way and a long day. Here, Christy looks back to where it all began, with afternoon showers passing by on all sides. 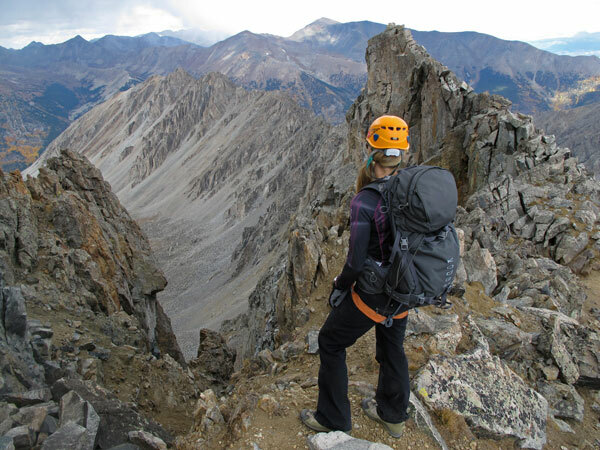 A slice of the ridge serves as a backdrop to Christy descending the La Plata summer trail. I bet even this part of the day was a challenge back in 1921. 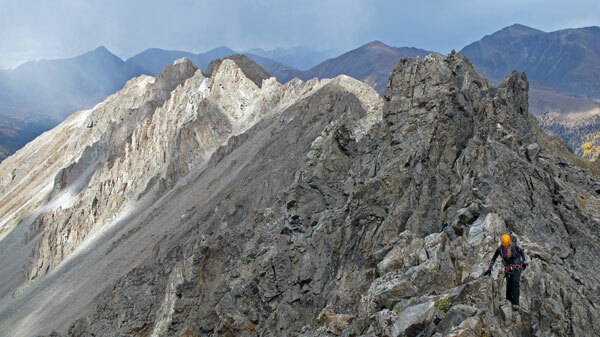 Devil's Armchair on Mount Ouray-- a worthy ski goal in the southern Sawatch Range. That is an impressive ridge, and that second photo really shows the loooong distance you have to cover to La Plata. At that terrain and altitude, that takes a while. A bit above my pay grade as a sometimes-scrambler, but I think it would be fun to try some of it some time, and who knows what the future holds…? Thanks for yet anther perfect day up high! It’s a long day. The nice thing is that you can skirt below much of the difficulties if you like, you don’t have to do the exposed stuff if you don’t want to.